Like a knife slicing through denim, the black dorsal fin broke the surface of the icy water quickly, and then disappeared into the depths. From his post on a sailboat roughly 300 meters from the surfacing creatures, Shapiro, a biological oceanography graduate student, counted at least six whales approaching in tight formation. He set down his binoculars and radioed to a trio of colleagues on an inflatable boat that was following the animals much more closely. Shapiro, a student in the MIT/WHOI Joint Program was referring to the D-tag, a digital recording device affixed temporarily (and non-invasively) to whales with suction cups. About the size of a cell phone, D-tags track the whales’ movements and record the sounds that whales make and hear in the oceans. Developed earlier this decade by WHOI engineer Mark Johnson and biologist Peter Tyack, Shapiro’s advisor, the tags have revolutionized the way scientists study marine mammals. Here, in the expansive Tysfjord of northern Norway, Shapiro was set to use D-tags in the fall of 2006 to learn more about orca whales. But first, researchers on the inflatable had to tag some whales. Christoffersen, the pilot, passed along Shapiro’s instructions to Jesper Jensen, clad against the cold in a fluorescent Mustang suit, who staggered against the howling wind and fought his way to the bow of the boat. Safely situated, Jensen bent down and grabbed a 7-meter (23-foot) long carbon-fiber pole. At the end of the pole, a D-tag was poised. As Christoffersen positioned the boat alongside the whales, a huge male orca surfaced just out of Jensen’s reach. After a few moments, another whale surfaced—another miss. The whales, probably feeding, were swimming around furiously in the water surrounding the boat. Just then, as one orca was readying to descend, Jensen lunged at it and pulled the pole back. The D-tag was gone. The moment the tagged whale dove beneath the surface, a saltwater switch on the D-tag instructed the device to start collecting data. A hydrophone on the tag recorded every call and click the whale uttered or heard. Elsewhere on the D-tag, an accelerometer and magnetometer began recording the whale’s depth and movements—raw data that ultimately would enable scientists to calculate every pitch and roll. 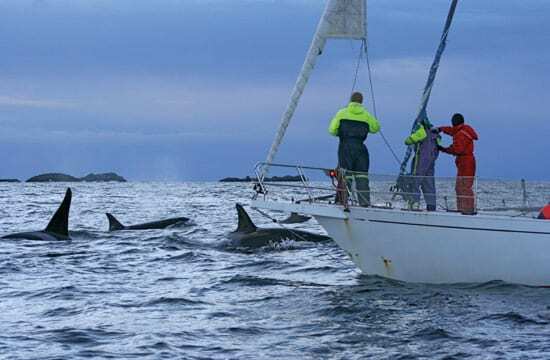 For years, fishermen and scientists alike have witnessed orcas swimming round and round schools of zigzagging herring in Tysfjord to gather them into a tight, wriggling mass. Then the whales slap their powerful tails on the corralled fish to stun them before devouring them one by one. Researchers have dubbed this behavior “carousel feeding” but have only begun to understand how the whales manage an attack that clearly requires coordination, and possibly communication. For Shapiro, D-tags offer a window into the depths of whale behavior. Late autumn is a dark time in Tysfjord. The area is one of the most expansive fjord systems in all of Norway, comprising hundreds of waterways. Because it sits on the western half of the Scandinavian Peninsula more than 155 miles north of the Arctic Circle, there are fewer than six hours of direct sunlight each day. Most mornings the sun didn’t rise before 8:30 a.m., poking over a horizon of jagged, snow-capped mountains in a glow of sherbet pink and orange that reflected on the water below. Norwegians call the largest of these mountains Stetind (shtet-in), the “Anvil of the Gods,” because of the way its summit forms a plateau 1,392 meters (4,567 feet) above sea level. They also voted the peak their national mountain in 2002. 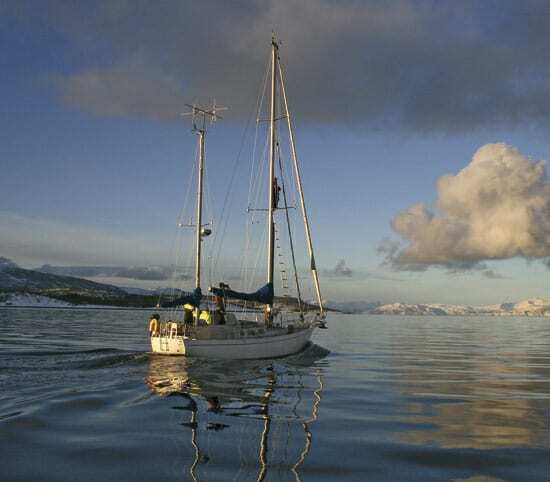 This setting served as the backdrop for a 30-day window of field observations on orcas. Over that time, 15 researchers from the United States, Canada, Denmark, Finland, Greenland, Portugal, Japan, and the United Kingdom pitched in—eight on Shapiro’s project and seven on another project coordinated by Patrick Miller, an MIT/WHOI Joint Program graduate and now a senior research fellow at the Sea Mammal Research Unit at the University of St. Andrews in Scotland. Researchers in both groups passed the daytime hours at sea, working on separate boats. Shapiro’s group used a 39-foot (11.9-meter) sailboat named the Iolaire. Though the boat had sails, Capt. Geoff Magee kept it under motor power the entire time to control its speed near the whales and minimize drift from frequent gusts off the mountains. The boat was property of Tiu Similä, a Finn who has been one of the most prominent whale researchers in northern Norway. 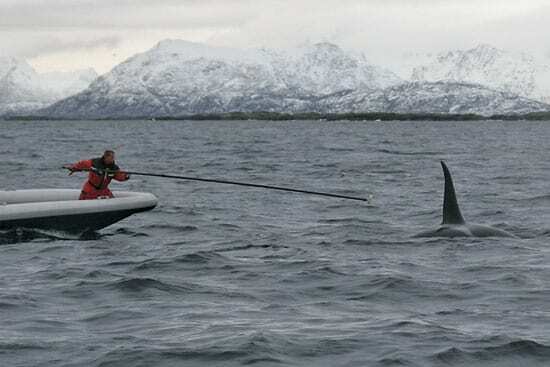 Similä is considered the “mother” of orca research in northern Norway, having brokered relationships among scientists, fishermen, and whale watchers for the better part of two decades. She was among the first to document carousel feeding and to compile a photo identification catalog of whales that frequent the Vestfjord area, which she made available to Shapiro, Miller, and the rest of the researchers from the beginning. Perhaps the boat’s most appealing feature was a stove below deck, which made the cabin a great place to dry off after hours in the cold and salty air. 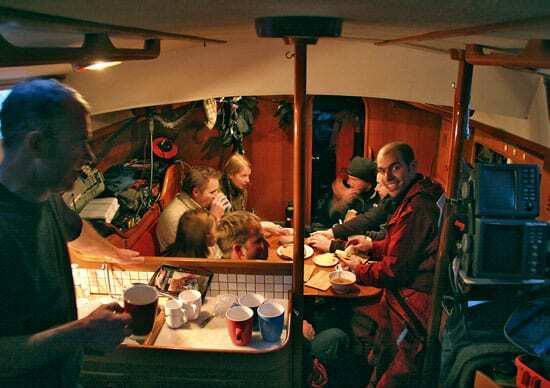 Back on shore, in the tiny fishing village of Korsnes, researchers shared two three-room cabins—modest vacation rentals with working kitchens. They dubbed one cabin the “eating hut” and used the common room there to host buffet-style meals for breakfast and dinner. The other cabin, known as the “science hut,” was where researchers went to study and tabulate data. 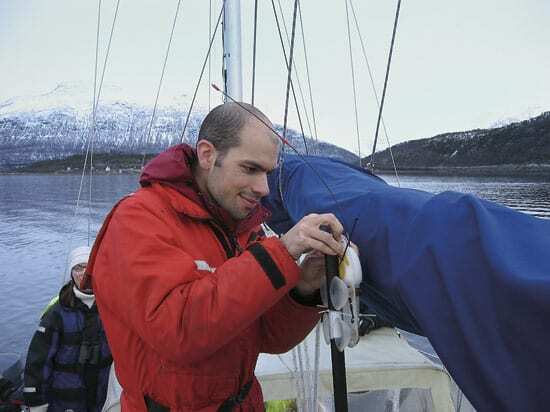 When the weather was too lousy to go out on the water at all, Shapiro and Miller hosted classes there, including tutorials on how to download and analyze data from D-tags. The group wasn’t alone out there. Korsnes is a working fishing community, and occasionally one of the researchers would buy fresh cod from a fisherman right off his boat. About a 15-minute van ride away, an ecotourism lodge named the Tysfjord Turistsenter offered free wireless Internet, which researchers (and at least one intrepid journalist) used whenever possible. Perhaps the strangest feature of the area was a lonesome ice cream truck that drove around at all hours of the day and night, blasting a catchy tune all the while. Even though the air itself was considerably below freezing, researchers hailed the truck frequently and enjoyed every last lick. They were onto something—even for an ice cream fanatic like me, frozen goodies never tasted so yummy. Shapiro’s research in Tysfjord actually began in November 2005. That season, Miller, Shapiro, and a team of international collaborators deployed eight D-tags on eight different whales. The scientists shared the data. It was a good deal for everyone involved. These first instruments recorded the sounds of all members of a group of whales, as well as the movements of the tagged individuals within the group. Five of the tagged animals engaged in carousel feeding. When fieldwork wrapped up in December of 2005, Shapiro and other researchers, including Tyack and Andy Solow of the WHOI Marine Policy Center, began exploring the D-tag data to identify movement and communication patterns. By correlating the whales’ sounds and movements, Shapiro is investigating how the marine mammals may communicate to coordinate their actions during feeding and other situations. He is also examining the different kinds of whale calls, their components and their sequences—in other words, the syntax of their vocalizations. Heading into November 2006, the plan was to jump in and resume the study. But there was a problem: no whales. Generally, killer whales swim into Tysfjord in autumn following schools of herring that return to the calm and nutrient-rich waters of the fjord to find food. By November, the herring had not returned, so neither did the whales. Shapiro and the researchers felt handcuffed for nearly three weeks before they received word that the animals were sighted in the area; even then, reports had them 30 miles west, in Vestfjord, where winds and open water would have made D-tagging challenging at best. One night, over burritos in the eating hut, Miller put the frustration into perspective. Indeed, science is like televised poker games: Hours upon hours of boring hands are edited out; we see only the exciting money hands. In the world of research, so too might scientists spend 30 days in the field for three or four good days that comprise the bulk of a published work. Eager for data, Miller and his team eventually used their sturdy boat and hit the open water. Shapiro’s team, on the other hand, waited things out in Tysfjord, passing time with transmission loss experiments. Using a speaker designed to broadcast tunes underwater for synchronized swimming, the crew repeatedly broadcast acoustic chirps into the water at various depths to gain a better sense of how sound travels in the area’s waterways. These sounds were recorded by a D-tag suspended from the inflatable, which was positioned at varying distances up to 500 meters (545 yards) away. This grunt work established the audio background onto which whales add their calls. The transmission loss experiments were conducted one day after another. One day, the rain was incessant. Another day, wind seemed to penetrate even the thickest fleece. Shapiro tried to keep the mood light with jokes and stories. At one point, he even handed out smiley-face pins as a token of camaraderie. Finally, the whales arrived. Fishing reports indicated the whales had been moving in and out of the Tysfjord area for a few days, but researchers aboard the Iolaire hadn’t spotted them near Korsnes yet. Miller’s group saw them first. Shapiro and his team celebrated their successes graciously; now they wanted some of their own. On Nov. 9, the whales made their way past Korsnes, darting across the horizon with whooshes as they surfaced to breathe. The water was so choppy that first day that neither the Iolaire nor the inflatable could get within tagging distance. Still, the mere sight of dorsal fins buoyed everyone’s spirits. Sea conditions were equally lousy on the morning of Nov. 10, but Shapiro’s team decided they could not wait any longer. The Iolaire and the inflatable both pushed off from the dock at Korsnes and headed west into a steady wind. About an hour later, the inflatable motored up alongside some whales, and Jensen made his heroic lunge. Back on Iolaire, Shapiro and his team were doing recordings of their own. From the first day of the season, the boat had been equipped with a homemade array of 12 hydrophones in a giant tube tailing behind the boat, specially designed to pick up sounds from the depths. The speedy inflatable followed the tagged whale, but the wind picked up considerably, making it difficult to spot whales among the whitecaps. As if the task weren’t difficult enough, the whales decided to pick up speed and started moving out of the area almost as quickly as they had come in. Nevertheless, the boat pursued. After about 90 minutes, the vessel had lost track of the whales, but Mike deRoos, a Canadian researcher on the inflatable, picked up a constant string of very-high-frequency beeps, indicating the tag had come off. An hour later, the inflatable found the tag floating in the water, full of precious data. Of course, the data remained raw until this winter, when Shapiro downloaded it and started making sense of what the D-tag recorded. In the first stage of data processing, Shapiro listened to the hours of audio data from each tagged animal, denoting when calls, tail slaps and echolocation clicks (sent out by and reflected back to whales to detect objects) occurred. Shapiro finished this step in February 2007. Next, he’ll go back through the record and analyze the calls—squeals, sirens, and bellows that whales make by moving air around in the chambers of their heads. Shapiro will attempt to correlate these sounds with behaviors to discern if orcas are communicating to coordinate their feeding. Still, comparing and contrasting thousands of calls won’t be easy. The first step is to run a pitch tracker to extract fundamental frequencies—that is, digital traces of certain wavelengths of sound. Shapiro plans to use software developed for telephone speech by Chao Wang and Stephanie Senneff at the Computer Science and Artificial Intelligence Lab at MIT, and he has hired undergraduates to help him parse through the data. Already, Shapiro said he has found that the whales increase their calling activity when they increase their movements during carousel feeding. Ultimately, he hopes to be able to identify certain call types and cadences and correlate them to certain cooperative feeding behaviors. Later, he’ll analyze these vocalizations to see whether the whales flexibly arrange smaller subunits of sound to assemble longer calls in their vocal repertoire. Whatever he finds, the research itself is a realization of one of Shapiro’s lifelong goals. During his childhood years, he was always fascinated with animals and why they did the things they did. Later, as a high school freshman in the suburbs of Cleveland, Ohio, Shapiro once began a presentation about marine biology with a photograph of a killer whale. In high school, Shapiro drew inspiration from his AP Biology teacher, Mrs. Nora Doerder, who animated his interests in the life sciences. By the time Shapiro entered Boston College in 1997, he was convinced he’d focus on molecular biology. In his second year, he met Donald Griffin, a biology professor emeritus who had been Tyack’s graduate student advisor at Rockefeller University. Griffin invited Shapiro to join him on a project studying a small group of Canadian beavers outside Concord, Mass. Shapiro jumped at the chance. The next summer, he was accepted into the WHOI Summer Student Fellowship Program and worked in Tyack’s lab under the direction of Miller, who was then a graduate student. After receiving a bachelor’s degree in biology, Shapiro spent a year at the University of St. Andrews, where he obtained a master’s degree in animal behavior for work that involved training gray seal pups. The following year Shapiro joined the MIT/WHOI Joint Program. His first project involved communication among narwhals, toothed whales that are famous for their unicorn-like tusks. That research was published in the September 2006 issue of the Journal of the Acoustical Society of America. 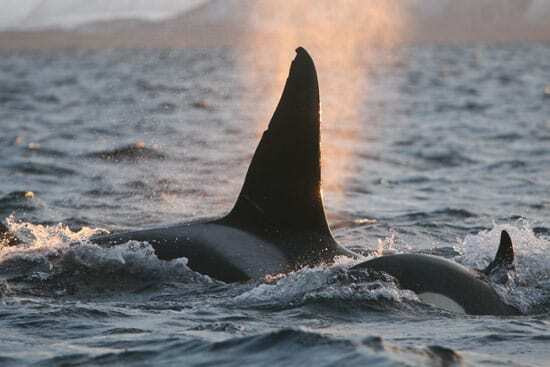 The opportunity to study the killer whales of Tysfjord finally presented itself in early 2005. 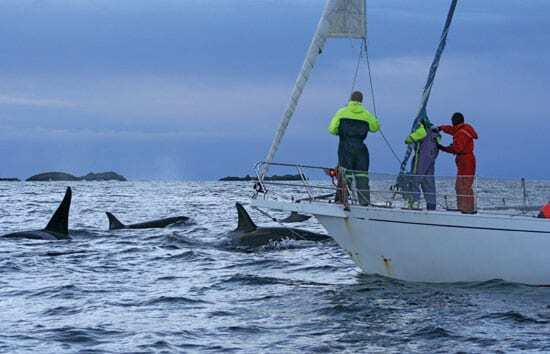 Representatives of the Norwegian navy contacted Tyack looking for guidance with experiments that would expose killer whales to controlled amounts of sonar activity. In exchange for advice and associated involvement, Tyack paved the way for Shapiro to research the same whales. 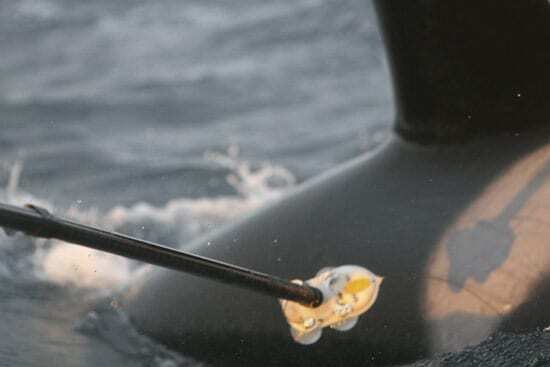 While the Norwegian navy did not run sonar tests during the 2005 season, it did conduct them in 2006. Local fishermen and ecotourism operators were quick to blame the tests for spooking the herring and keeping whale sightings low. During my brief visit to Tysfjord, the locals met with researchers and navy officials at the Tysfjord Turistsenter in a heated discussion about the future. While Miller and other scientists remained patient during the two-hour talk, many local boat captains and naturalists became animated when expressing their concerns to the navy about the long-term prospects of the area’s nascent whale-watching business with no whales. Nobody knows for sure yet what the impacts of future testing might be on the whales or on whale research in Tysfjord. This project was funded by the Ocean Life Institute at WHOI, the National Geographic Society, the MIT Undergraduate Research Opportunities Program Office, and the National Defense Science and Engineering Graduate Fellowship.